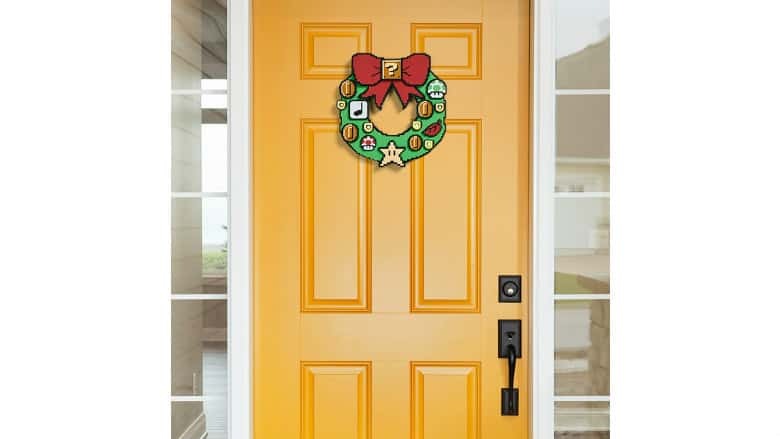 Nintendo Super Mario Light-Up Wreath Brings the Mushroom Kingdom to Your Door | Nerd Much? Some of you have already done it. After Thanksgiving next week, many more of you will then jump on board. It’s time to go up into your attic or down into those garages and basements to start digging out decorations. It’s damn near Christmas time, folks. And this year ThinkGeek is releasing their Nintendo Super Mario Light-Up Wreath to bring the nerdy décor to your front door. 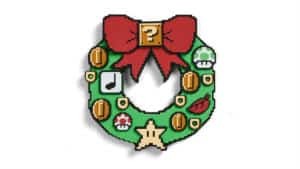 The Nintendo Super Mario Light-Up Wreath is comprised numerous sprites that are perfectly replicated from Super Mario Bros. 3. There are sprites for Super Mushrooms, 1-Up Mushrooms, Donut Blocks, Note Blocks, Coins, Super Leaves, and Super Stars. 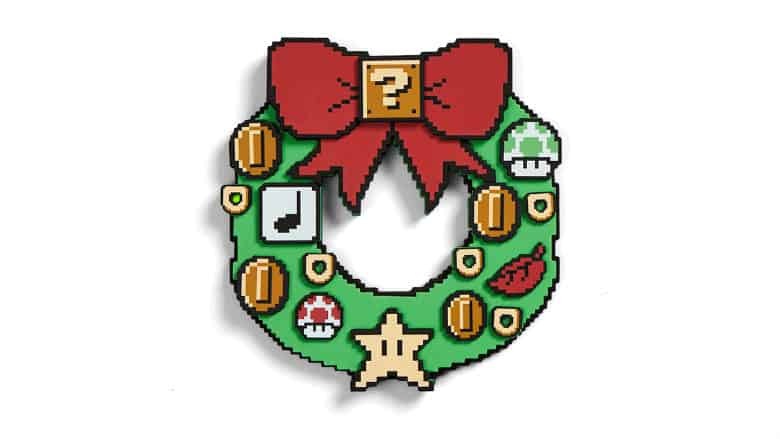 The Donut Blocks in the wreath have blinking green lights embedded within them too, ensuring your Super Mario wreath is extra festive. You can turn the lights on and off to preserve the decorations battery life too. 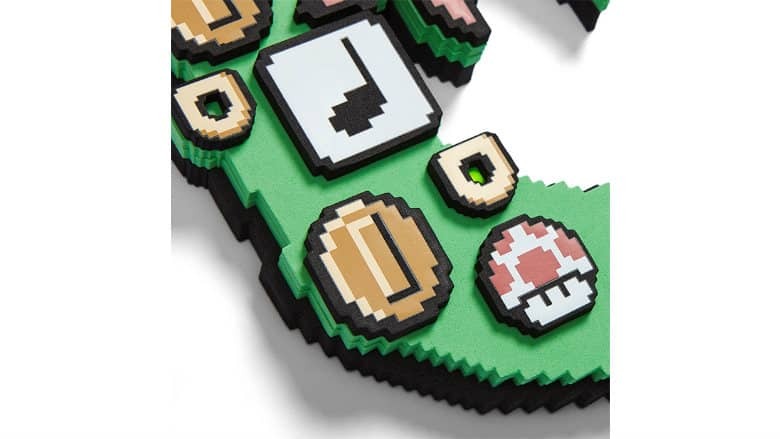 ThinkGeek’s officially licensed Nintendo Super Mario Light-Up Wreath is comprised of durable EVA craft foam and measures 9 1/2″ across by 10″ tall x 1 1/2″ thick. It sports a keyhole slot on its back so it can be easily hung on a wall or door. And it also has the ability to stand on its own, though ThinkGeek warns it stands “a little precariously, but it does”. It won’t take a ton of gold coins to get this Nintendo Super Mario Light-Up Wreath into your home. It’s currently listing on the site at a price of $19.99. But hey, if wreaths aren’t your thing, there’s plenty of other ways you can show off your love for the Mario series. Might we suggest this it’s so awesome it’s scary Super Mario Boo Bean Bag? Because if you aren’t going to start decorating for Christmas next week, then you might as well be comfortable why you’re lounging around doing nothing, right?